This Sock is suitable for both spill containment and absorption, especially for ongoing spill-prone areas or leaks, on land or water. Each sock is able to be left in a location to absorb and contain continuous leaks and spills, and is also available in a universal model. This product offers an environmentally-friendly alternative to synthetic polypropylene products. All socks contain our treated recycled cellulose material, XtraSorb, and are contained in a natural, permeable cotton jacket. The Sock is most effective when used in conjunction with KleenSweep and is an integral part of any spill response system. For use on all hard surfaces and on water to absorb oil and fuel spills. Absorbent socks can be used for cleaning up spills of animal, vegetable, mineral and synthetic oils, and oil-based paints. Commonly used in the automotive, industrial, commercial markets, marine, warehousing, waste management and manufacturing industries. Highly absorbent — absorbs a wide range of hydrocarbons. 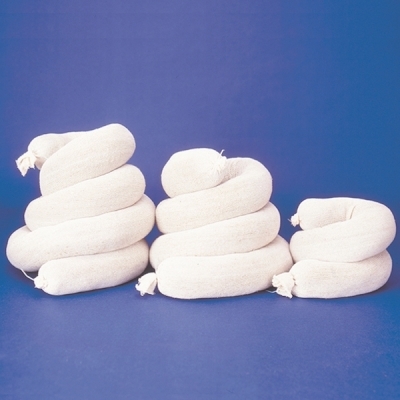 Each 1.2m sock absorbs up to 16L (oil), 19 times its own weight. User friendly — quick, lightweight, and easy to use and offers multiple disposal options. Environmentally friendly — sustainably manufactured, natural, non-toxic and biodegradable in 2-5 months. Specialisation — available in Universal form for both oil and water based spills on land.